To find out more about any of our products or services call (+44 or 0)116 276 4242 now! Mekko Technologies is a reliable, privately owned business specialising in our own UK manufactured conveyor ovens and humidity controlled drying and storage equipment (Dry storage cabinets). We are also distributors for MDC automatic pick & place machines and ScreenArt manual printers for solder paste. New, ex-demonstration and refurbished equipment can be supplied, all with full guarantees and after-sales support. We have over twenty years' experience in manufacturing conveyor ovens for solder reflow, and more recently for the catering trade. 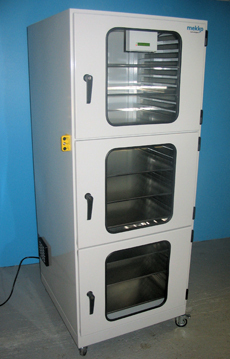 About five years ago we designed our "Active Desiccant" drying and storage cabinets (Dry storage cabinets) as a better alternative to nitrogen and baking ovens. Our new range of dry storage cabinets offers an efficient means of actively drying components as well as simple dry storage. One of the main benefits of our design is that the drying unit is switched on and off by an output from the microprocessor controlled humidity meter. This means that if a door is opened and the humidity rises, then the drying unit will switch on straight away to bring the humidity swiftly back to spec. There is little maintenance required, and the rotary desiccant absorption/regenerating dryer unit allows continuous dehumidifying without interruption. The rotating desiccant wheel both dries and regenerates at the same time! Outstanding dehumidifying results are easily achieved. The internal humidity is guaranteed to less than 3%RH, to exceed the requirements of IPC/JEDEC J-STD-033B industry standard. Normally less than 2 minutes to return to less than 5% RH after a door is opened! The Mekko cabinets are built in the UK, and now incorporate our own MTX-Flow Technology Dehumidifier for rapid moisture removal from components. The humidity sensor probes used in our cabinets are very high accuracy instruments, and are far superior to our competitors. Most suppliers use sensor probes with an accuracy of only +/-3%RH. Our probes are calibrated against a factory working standard instrument which is calibrated by Rotronic in accordance with the requirements of the United Kingdom Accreditation Service (UKAS). This results in an uncertainty of less than 1%RH at a displayed reading in our cabinets of 5%RH at 23 degrees C.
Unit 16, Buckland Road, Leicester, LE5 0NT, England.